Well hell, we got a little rain last night but it did not raise the levels again. At best it kept the status quo going. That being near clear water in the shallow faster areas and a light green in the pools. 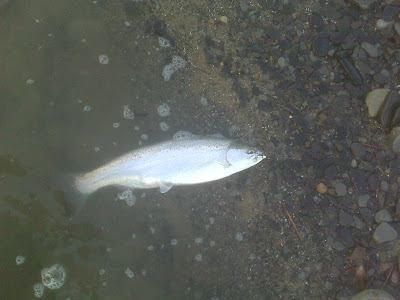 I am happy to announce that my casting skills came back this morning as there was no wind blowing in my face. I made more than a few bomb casts that even suprised me. In addition I double bagged my feet with plastic bags to prevent damp foot from my drying waders and to facilitate entrance and exit from the them. I had a flash back to when I was in grade school and mom sent me off to school with my feet in platic bags inside my Sorel pack boots so I wouldnt get wet foot from the high snow. The action was slower than the day before for me but Idid manage a few fish on white jigs and chartreuse sacks. The day once again was filled with a number of light biters. 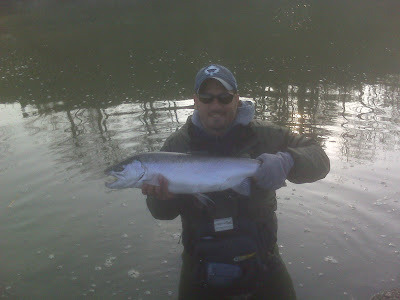 Literally I was visuallizing the steelhead bumping the offering with thier nose like a pig rutting around in the dirt. Just enough to momentarily drop the float. This happend more than a few times. There were a few a few instances where I clear pulled the float and offering out of the water over my head and onto the shore. Frustrating indeed but the action keeps you busy. We still need rain to bring in a solid run and we are supposed to get it Saturday night and into Sunday. I can't remember what it feels like to fight one. I have a case of Jones creeping up on me. The North wind has put the St Clair off. Hope to get out next week. Until then keep putting them on the bank for us. It really was a beautiful fish!